The Excise Department has reported that the enforcement of the new 2017 Excise Tax Act has made 90% progress. Prime Minister Prayut Chan-o-cha expressed his concerns over agricultural issues, calling on farmers to adjust their methods to minimize costs and maximize yields. People in Khon Kaen province are using sandbags to divert water released from Ubolratana Dam. GOVERNMENT Housing Bank (GHB) will likely put its lending rates on hold for six to eight months in an effort to ease the interest burden on its borrowers. Citizens in the lower north, central and northeast continue to suffer from flood conditions with water levels not showing any sign of receding. Farmers in Khan Dong district were left with no choice but to harvest their crops prematurely as water from the overflowing Moon River spread over at least 2,000 rai of paddy fields at four villages in the north of the province, and was continuing to rise. BEST Western Hotels & Resorts is seeking opportunities to introduce all three of its sub-brands under its SureStay Hotel Group in Thailand to cash in on the country’s rising demand for globally branded, standardised budget accommodation, said Olivier Berrivin, Best Western Hotels & Resorts managing director for international operations, Asia. Privately owned land in Chachoengsao and Chon Buri is to be expropriated for the construction of stations for high-speed rail lines linking three airports, a senior State Railway of Thailand official said on Monday. The Thai Chamber of Commerce expects the Thai economy to grow in the fourth quarter of the year, as the tourism and export sectors improve. Thai Airways International’s (THAI) shoddy record on punctuality has caused Thai travellers to sarcastically refer its airline code TG as “tomorrow go”. The Secretary-General of the National Broadcasting and Telecommunications Commission (NBTC) has disclosed that the body has injected 190.58 million baht from its third quarter earnings into the Digital Economy (DE) Fund in accordance with the Digital Economy and Society Development Act. Thailand’s Dtac has reported an 8.8% year-on-year decrease in net profit for the third quarter of 2017 as a result of declining revenue and costs associated with network investment. The Minister of Commerce has directed three of the office’s departments to draft plans that enhance the farm goods chain, and to identify more markets for produce. His Majesty the King has kindly instructed the government to allocate more areas for people observing the royal cremation ceremony at Sanam Luang while the government is satisfied with the recent full-dress rehearsals of royal funeral processions. 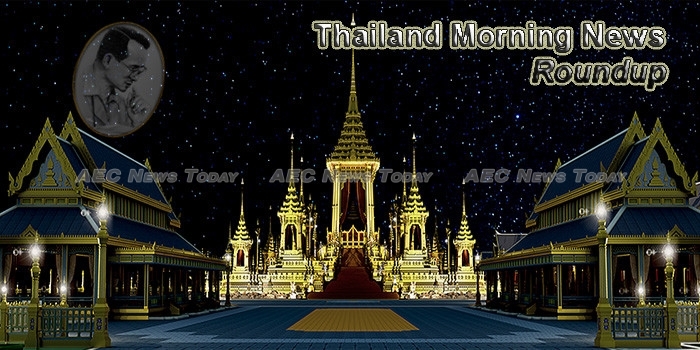 The Royal Thai Police has announced no fewer than 150,000 police officers will be deployed at funeral sites across Thailand during cremation week.